The Bible is an incredible book full of mysteries and wisdom. Passages that might seem mundane at first reading can often provide hidden clues to problem-solving our everyday life. Often as I’m reading, certain passages seem to jump out at me. I believe the Lord highlights scriptures for us right when we need them. As we meditate on those illuminated scriptures, we discover those important hidden messages. Today my reading was from 1 Kings 22. At first glance, it reads just like a pivotal historical story. The chapter starts with a war planning strategy session between two kings. A lot goes on in this session, including the kings calling both the false prophets and a true prophet to predict the outcome of the battle. 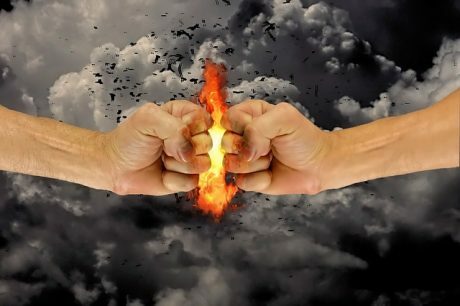 This is the very famous battle where King Ahab is killed and Elijah’s previous prophecy from 1 Kings 21:19 is fulfilled. At this time the kingdom of Israel was divided into two halves—Judah and Israel. Ahab, the king of Israel wanted Judah to join in battle to fight a common enemy. To increase his army strength, he needed to pull Israel into the battle plan. The King of Israel said yes, provided they get further instruction from God. Let’s put this scenario into our everyday lives—and our marriages. If we clearly hear from God not to do something, but we join with our spouse and do it anyway, the end result can be disastrous. A few years ago, God told me very clearly not to click on a “too good to be true” email. Not only did I click on it, I shared it with my husband, who bought the story—hook, line and sinker. We ended up pursuing this disastrous financial venture. It turned out that the CEO was very clever con man. We ended up losing a good chunk of our life savings. If only I had listened to God. Most marriages are one physically and financially. 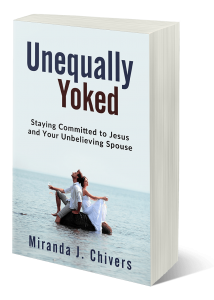 But in the unequally yoked marriage, we are not one spiritually. We follow a different spirit. We don’t follow the evil Ahab spirit, we follow the Holy Spirit. This is where we part ways with our unbelieving spouse. Our togetherness in the physical and financial realms often pulls us into uncomfortable situations. We desperately want to be together in every way. We blind ourselves to the reality that there is a real enemy waiting to destroy us—mentally, emotionally, financially and also our marriage. That’s the enemy’s job—to kill, steal and destroy. In our desperate attempt to keep our marriage together or to make the other person happy, we give in to their plea to join in unhealthy activities, compromising situations or even bad legal agreements. Manipulation is one of the enemy’s greatest tactics. He knows how to encourage our spouse to manipulate us. He knows our soft spots and our tender hearts. He knows how much we love our unsaved family and he will pull us off track, and use our spouse or other loved ones to do it. It is so important to listen to the Lord’s voice and follow that still, small leading—even if it’s different from the advice our spouse is giving. God wants the best for us. His advice is always better than anything the world can concoct. If we can truly believe that and follow him first, we can achieve success in the most difficult battles. Excellent post. I’d say you are well on your way. Your topic is one that is often not touched on and you backed it up with sound scripture and piqued my curiosity to read that portion of scripture plus others. Also you willingness to be vulnerable and share from a painful experience always draws the reader in. We have all been there…listened to something that we knew that we shouldn’t have and the results were as you described. Readers always want to relate first in order to be willing to listen to what you have to say. Thanks for this. Thank you so much for your kind words. I pray you find the support and guidance that you need to carry on this challenging journey.